About the handiest little problem solver to come along since pockets on shirts! The innovative design with an interlocking "channel and key" built into its base gives TacoStandUp a unique usefulness. Serve 1, 2, 4, 6 or any number of tacos. 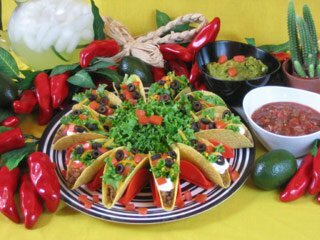 There is almost no limit to the variations with which you can arrange your tacos for serving. Get creative! TacoStandUp products are not intended for use in microwaves/ovens. 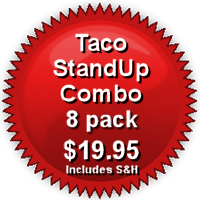 "No kitchen is complete without TacoStandUp"
Is it even possible to only eat one taco? Never fear, Taco StandUp has you covered! Add as many tacos as you want with our easy design! 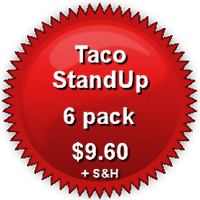 our original TacoStandUp works great for your crispy corn tortilla ‘hard shell’ tacos. Introducing NEW! 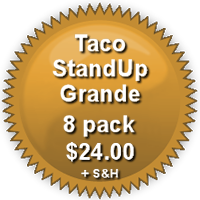 - TacoStandUp 'El Grande' from TacoStandUp. 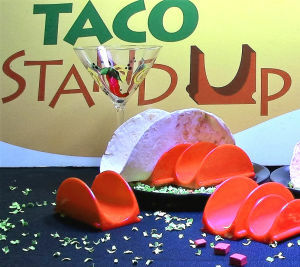 Our new larger TacoStandUp 'El Grande' is the perfect larger taco holder for soft shell taco lovers. Same innovative interlocking design. Same unique usefulness. Same warm red color. Same fun! TacoStandUp 'El Grande' is dishwasher safe and stacks on end for convenient storage. They're super durable, made of food grade ABS plastic (no BAP) and weigh 2.0 oz ea! Like it's little brother TacoStandUp, New TacoStandUp 'El Grande's work great and will make your soft shell tacos look great on the plate. No more taco fallout, no more taco turnover. Holds your super size overstuff hard shells great too. is perfect for your flour tortilla ‘soft shell’ tacos. Preparation is twice as fast because now you have both hands free. No more balancing act -- no more taco fallout! TacoStandUps work great and make your tacos look great on the plate. You'll serve your family and friends your delicious tacos in a visually appealing, appetizing new way. TacoStandUps are super durable, and have a nice "weighty" feel. Dishwasher and Freezer safe. TacoStandUps are made of ABS and contain no BPA. Not for use in microwaves or ovens. TacoStandUps stack on end for convenient, space-saving storage.